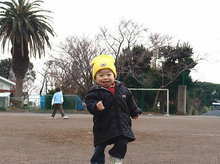 And then his sister, Hikari noticed that Yuuki was there and started to run toward us. "Hai, Yuuki ! Thank you for coming to bring my baggages." my sister said. After that we went to the home of Hikari’s friend together.